I have always loved dabbling in DIY projects but in all honesty, I have steered well away from any that required power tools. That side of it all seemed a tad bit scary! 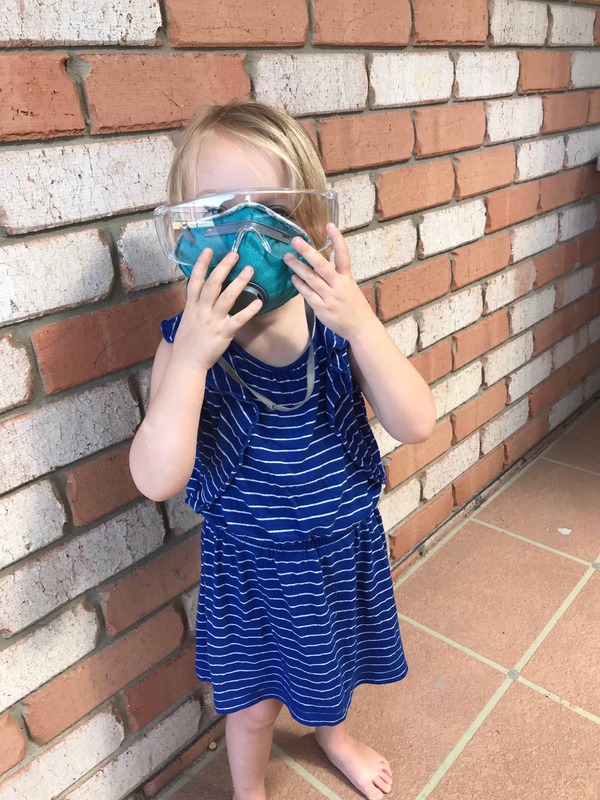 I grew up with a tradie dad, so it was pretty easy to just have his expertise complete the job instead! That was the easy way out, even right up until recently, if I had a home maintenance job that needed doing, Dad was just a phone call away. Trust me… hubby isn’t an expert handyman. This was the safe option! Until my parents became grey nomads and we were left to fend for ourselves! We actually did not even own much in the way of power tools. Of course the usual garden maintenance stuff – a petrol mower, line trimmer and gifted Ryobi One+ Blower last Christmas. The concept of a single battery to rule them all sounded pretty impressive though! 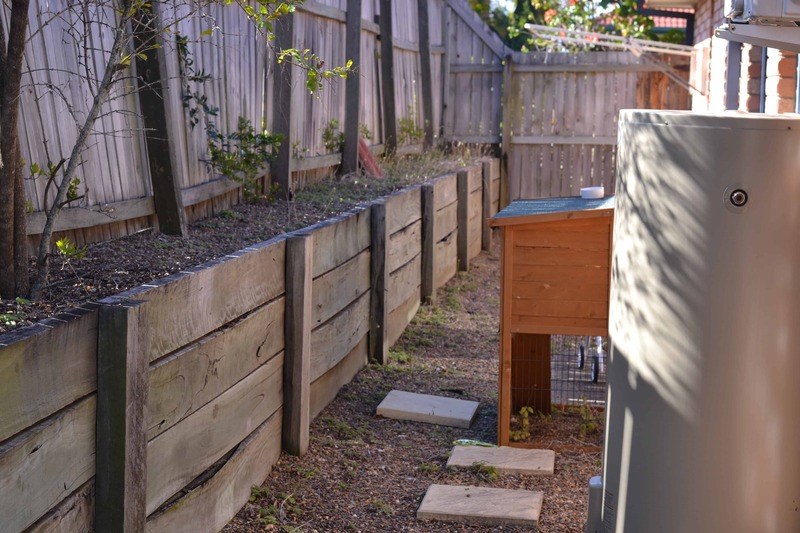 So when I was given the opportunity to do a backyard makeover with Ryobi’s help, I was keen as mustard! The backyard maintenance has always been up to my husband, with the exception of a few smaller tasks I might help out with here and there. Pretty much the extent of my outdoor duties is to tend to our raised garden bed… which is currently not in a great state! I failed to get it ready for winter perhaps! Otherwise for hubby, his duties mostly consist of mowing the lawns every month or so and the occasional trimming of a hedge. However with his hours getting longer at work after a role change, and so many busy weekends with family activities and other commitments, finding time can be a struggle for him. 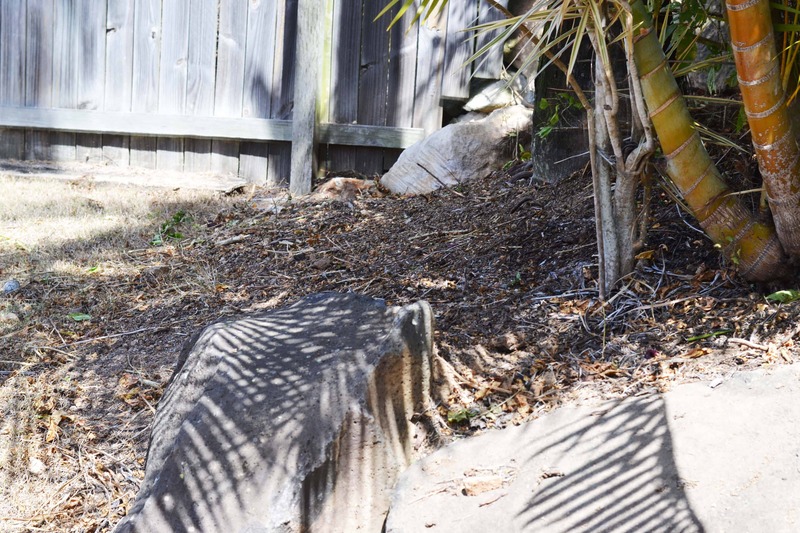 The yard was getting pretty shabby and some parts have been long neglected because they simply were not high priority compared to other things that needed doing. 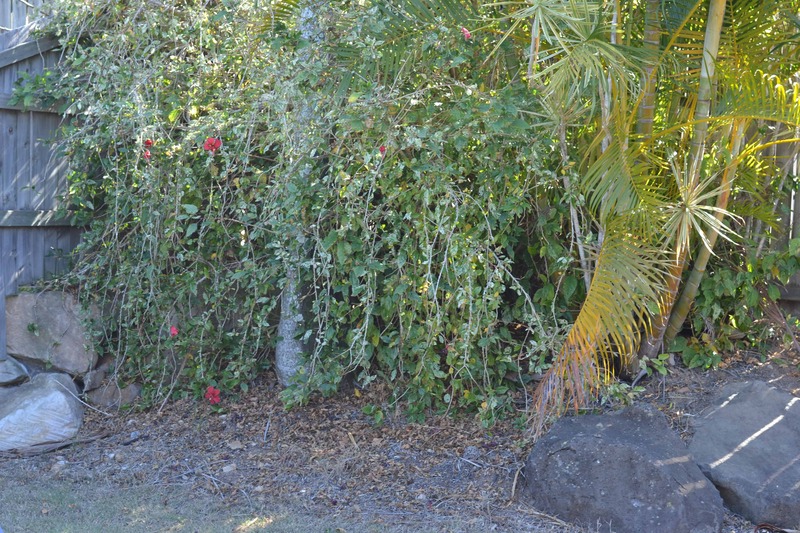 Garden beds overgrown. Branches sprouting out every direction. And do you know how freaky it is on a windy night when a branch scrapes against the window. Oh hello scary noises. You know the garden needs some work when that starts happening! Then there is the side yard where the clothesline lives. It has weeds sprouting up everywhere, from beneath the rocks underground and along the garden beds. 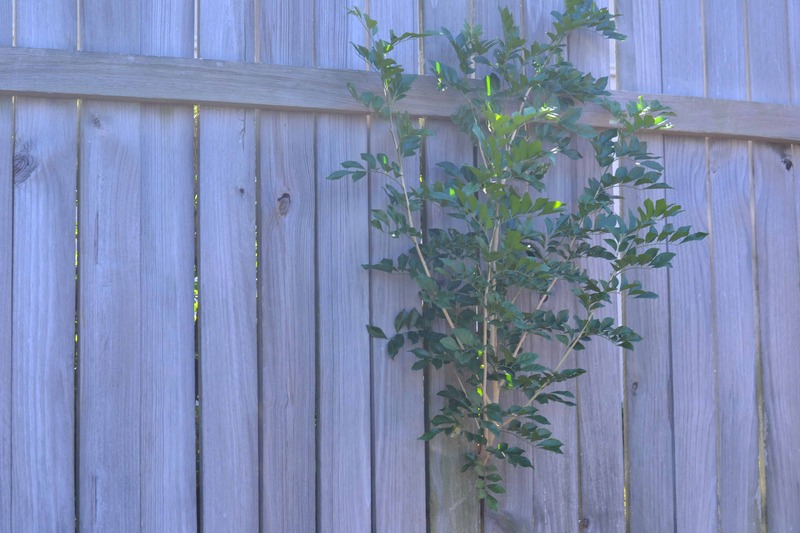 And we seem to have adopted some trees from the neighbours that are growing through our fence. At least we know we aren’t the only ones without a green thumb in the street. Yes, it is all in a pretty bad state of disarray really! Meanwhile, I work from home. I am busy too, but it’s much easier for me to pop outside for an hour and get the yard maintenance done. Even if I wanted to though, never in a million years would I know how to start a lawn mower. And mixing fuel… umm no thanks! But guess what, there’s a battery operated alternative that doesn’t need fuel. And this is where Ryobi One+ comes to the rescue for home maintenance projects! The Ryobi ONE+ range bring cordless technology to power tools with their growing battery operated range. 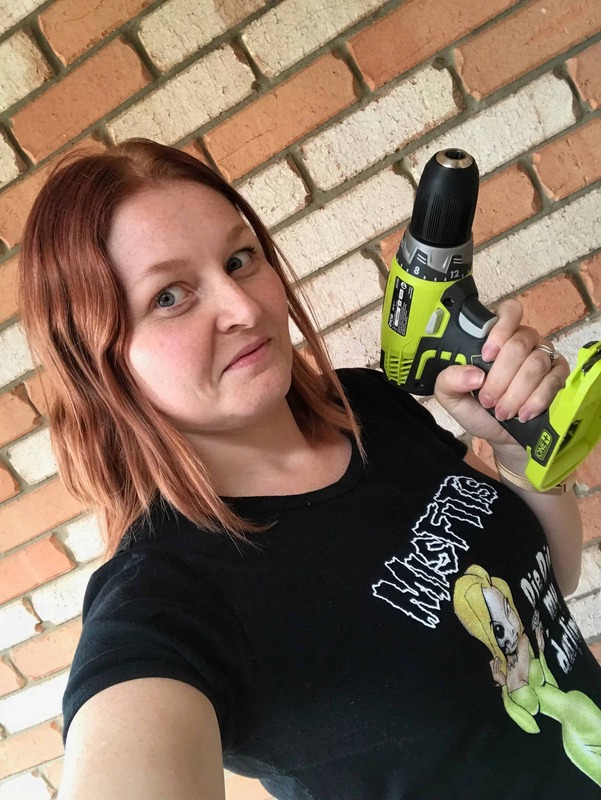 There are over 70 different power tools in the Ryobi ONE+ range that have you covered for pretty much any project you can think of, indoors and outdoors, and definitely for a backyard makeover project like mine! Ryobi’s goal is to create intuitive power tools that are easy to use, even if you don’t have any trade experience, because let’s face it… most of us don’t! They are suited to every day users and this means us women too! The Ryobi ONE+ tool range is exclusively sold in Bunnings within Australia and New Zealand. And because they are so confident in their range, Ryobi offers a 6 year replacement warranty* on their ONE+ cordless tools and a 3 year warranty on the batteries too. The cool thing is when you have one Ryobi ONE+ tool and battery combo, you can use that same battery with other tools in the range so you don’t need multiple batteries. Although of course more than one can come in handy too for longer projects and to save you switching between them if you are using two tools interchangeably. Now to see how well a couple of these tools can create a spring yard tidy up, completed by yours truly! * Please note the 6 year warranty applies to cordless products registered at www.ryobi.com.au. Batteries and chargers have 3 year warranty only. Corded tools have a 4 year warranty. When our Ryobi ONE+ tools arrived I was so relieved to find how easy they were to set up and get started. There was very minimal assembly required, even for the lawn mower, and in most cases, it was really just a matter of charging up the battery, clipping it in and getting on with the job. For us, the biggest area that needed work were our gardens. 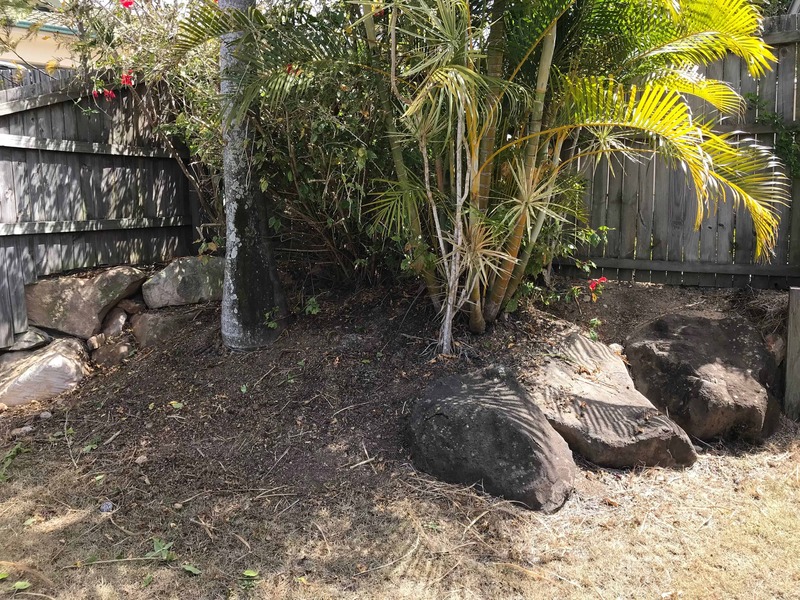 We rarely spend time maintaining them and as a result, there was a lot of overgrown trees and hedges, thick ground cover from years of fallen leaves and also a few palm branches that had fallen. Pretty much our maintenance typically consists of mowing, and throwing away fallen palm branches, with the occasional weed spray. So first step was to start with the easy part, and get the lawns looking good. It’s tough to make them look good at the moment though as we have had so little rain so while the grass itself isn’t growing very well, there are lots of ugly tall weeds poking up and as a whole our ground is quite uneven right now. The Ryobi One+ cordless lawn mower was so easy to operate and did not struggle over the thicker areas of the lawn or where the ground was less even. Having never used a mower before, I found it so easy to use. And super quick too! It has a level to allow you to adjust the height of the mower too, which helps you manage different types of lawns and ground. I wouldn’t hesitate to use the mower in future knowing it is so easy and effective! The next tool in the Ryobi range I put to the test was the cordless edger. Now this one I will admit was a bit trickier for me and needs a bit more practice. The best advice is to go really slowly so you can keep it up close to your pathway and driveways. 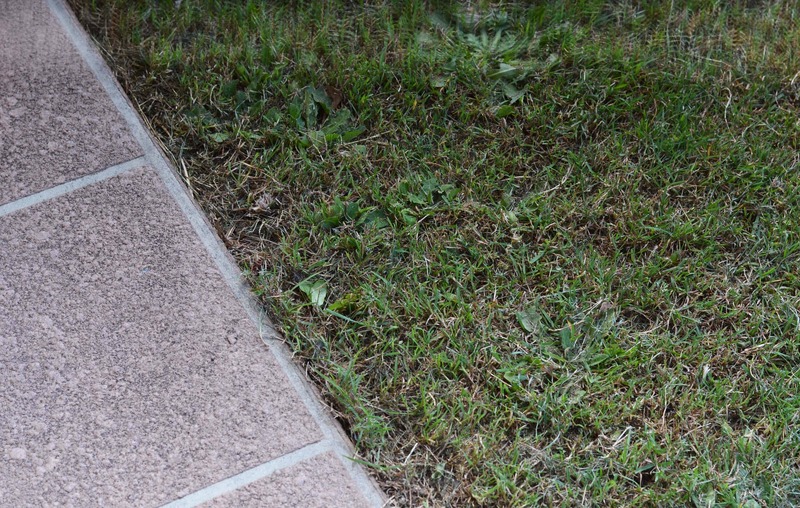 If you go too quick, it may veer off a little and you could end up with a strip of dirt in your lawn. Ooops. Meanwhile my husband did have a little play with some of the tools after me and he found it pretty easy to use on his first attempt. Clearly I am impatient! However I do love the look of having the edges so tidy along our patio especially. We have a serious weed problem up our side yard where after so many years our weed mesh is no longer very effective. The worst part is the weeds growing are really hard to get rid of too and have massive root systems so often when you try and manually pull them out, they snap off and regrow. We have sprayed them on and off over the years but know that we do need to get the whole area re-done with some new weed mesh eventually. However spraying the weeds is a quick fix for a short term improvement on the areas and the Ryobi ONE+ weed sprayer is really easy to use. If you have ever had to purchase weed spray from Bunnings or other hardware shops, you will know it can be very pricey, especially when you need to purchase the ones with the spray handles or hose attachments like we have in the past. The great thing with the Ryobi weed sprayer is you don’t need that now. You simply need the chemical itself so you can save money in the long term. In saying that, the chemical we did get wasn’t powerful enough for a total eradication of the annoying weeds in our side area. Next time we will go for something that kills all the things!! However the weed sprayer itself was easy to use. After – need something more potent to kill these weeds! It has a wide area to pour the chemical in so you have minimal chance of spillage. Definitely a positive when using chemicals, as I try to avoid having to use chemicals for much at home. Weeds are an exception! And the fact it has a shoulder strap means it is comfortable to use, and you aren’t carrying all that weight of the liquid just in your arms. It helps you have better control over the hose this way too. You can adjust the nozzle to change the spray pressure and the fact that it is battery operated means no sore hand from continually pumping a spray bottle either! Winning! 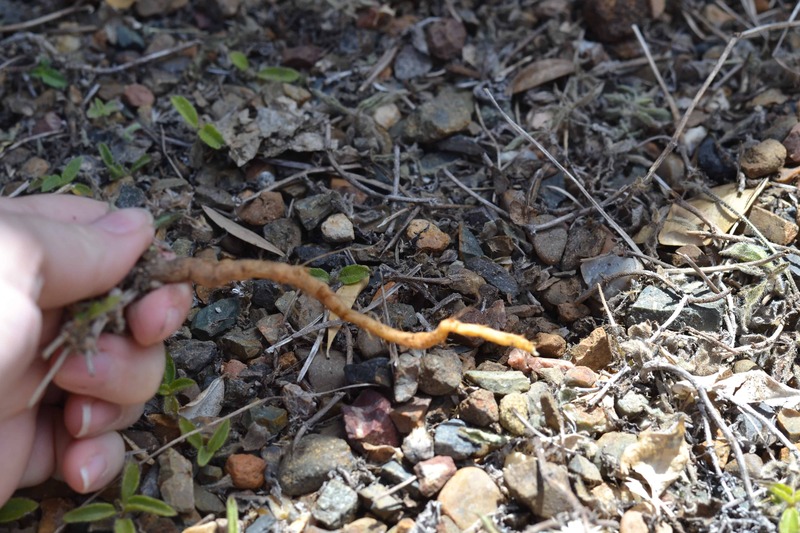 See what I mean about these crazy big roots – these weeds are tough! Our garden beds were in bad shape! We had trees so overgrown they were scratching against windows and gutters. They were so busy and downright ugly really. Because everything was so overgrown, the branches had stretched out further in attempts to find the sun, so the shapes of the trees had essentially changed over time too. They weren’t very pretty! Like our side yard, our front garden really needs to be redone with a weed mesh as it is pretty much growing grass like our lawn these days! It was quite a pretty garden when we first moved in almost a decade ago and an area that needs some love definitely when we can afford to invest a little more into it. However right now our biggest focus was getting both our garden bed areas cut back and neat. The front one especially needed to be cut back away from the windows and the house as it was even blocking our security light sensor. They also needed a huge clean up underneath as both had so much ground cover from years of fallen leaves and branches. There is only so much we could do to clear up our back garden which is essentially dirt underneath, but it sure did make a different to get rid of a lot of that mess. The whole garden bed is a lot more open now, thanks to the Ryobi ONE+ Cordless hedge trimmer. 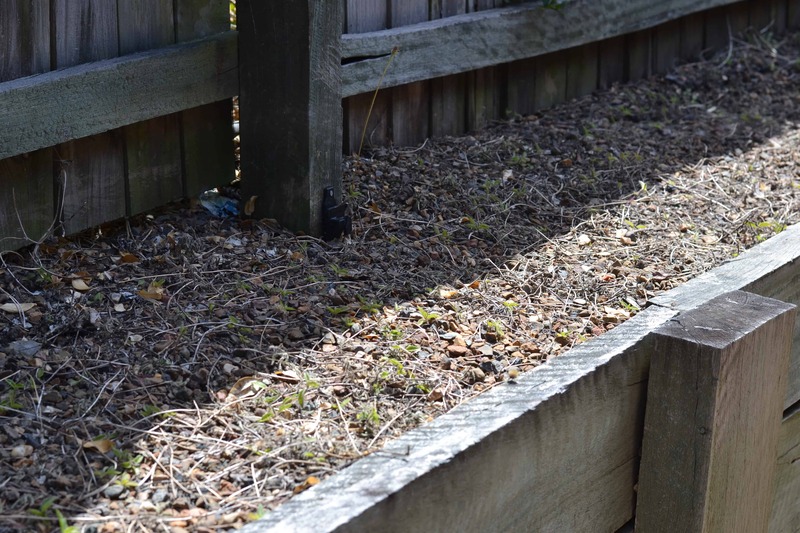 After – back garden bed. You can see the ground again!!! I will admit this was my favourite of the tools we got to put to use. It was a little scary at first but I feel like a total pro at it after having used it a few times now. It is really powerful and cuts through branches up to an inch thick as well… not just hedges and twigs. I was impressed by this as it meant not having to get a second tool out to cut the bigger branches when trimming back our garden trees. It has rotating blades that make trimming hedges a really quick and easy job too. And being such a length meant not only could you reach high branches without needing a ladder, but you can also make an easy job of tidying up large hedges with a single motion. 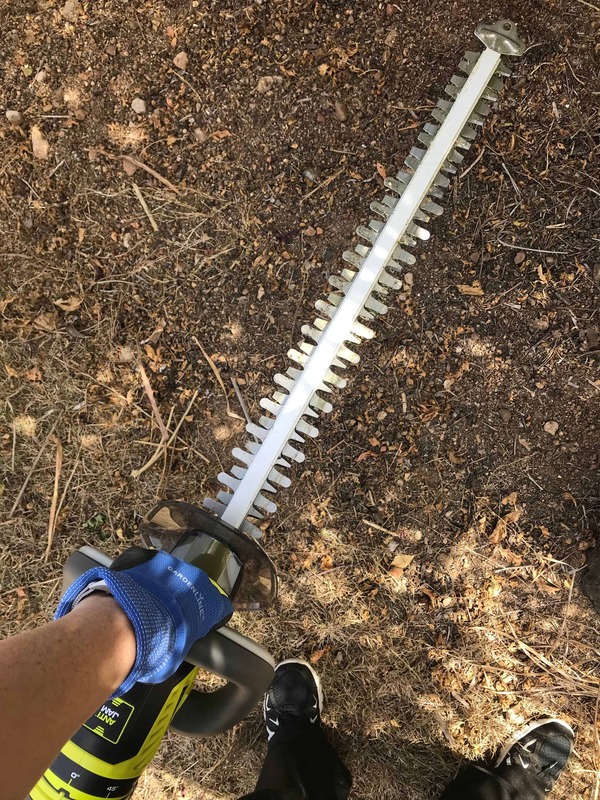 The hedge trimmer is light weight which is good because other than carrying a sometimes lazy 3 year old, I don’t do a lot of lifting and was worried how I would go holding it up. Yes I was a bit worn out afterwards, but I was able to do a lot of trimming without getting too tired or sore! Of course all that trimming with the Ryobi ONE+ cordless hedge trimmer meant I made an even bigger mess at the bottom of the garden, so I waited until all that was done before worrying about raking up the ground cover. Before we trimmed it back – it’s not so pretty now but it will grow back nicer! 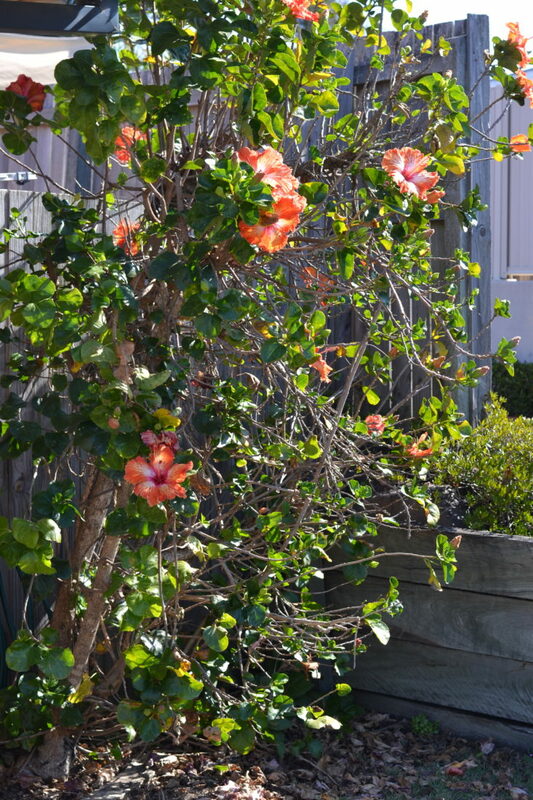 We also gave our hibiscus tree a big trim. It’s not so pretty now but it was hitting against the house a lot so while we didn’t have many flowers left on it once we trimmed it back, it will regrow without so many of the tall problematic branches now. Our fence is starting to show the signs of age with some of the planks bending and many of the nails and screws quite old and rusty, so without proper tools, hubby would typically get a trusty old hammer out and try to whack them back into position. It isn’t always effective! However the Ryobi ONE+ compact drill driver is. It’s super small which means lightweight… which is perfect for me! This set is actually pretty amazing as it comes with the drill, plus two different sized batteries and charger, all in a compact storage bag. A great starter set for your Ryobi battery operated collection! The drill is also perfect for doing any simple repairs around your yard, such as putting fence panels back in place, putting play equipment together and putting things up on the fence or wall outdoors and in the patio area. These are all important parts of your spring yard maintenance. After all that mowing and edging and general clean up, our patio was a bit of a mess with grass and debris so lucky we already have a Ryobi ONE+ blower to use for the clean up. We actually got this for Christmas and I will admit I was a bit disappointed with it as a gift back then. Never in a million years did I picture myself doing the outdoor work, but hey… it’s not that hard really! 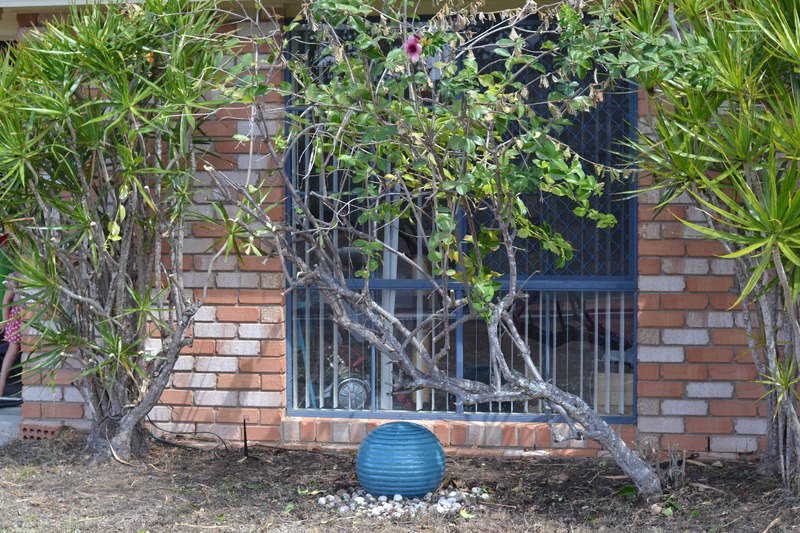 After – Front garden is way neater now without so many branches. It was twice as bushy to start with and scratching against the house plus you couldn’t see the ground under all the fallen leaves. We did quite an impressive role reversal over the weekend. I was outside mowing, chopping, trimming and all that, and meanwhile my husband was in the kitchen cleaning up and making lunch! Okay… he does that quite often really. It’s only me that was doing something new! Having the Ryobi ONE+ battery operated tools made our backyard maintenance a lot easier than it would have been otherwise and allowed us to give the yard a bigger clean up than we have in ages. Well I should say me. Because that’s right… it was me who did the hard work! For someone who would never usually do that tough outdoor work, I am proud to say these tools are so lightweight and simple to use that even a total novice like me was able to do so. Mowing, hedging, edging, drilling and all the rest. All things I had never done myself before and things I would be quite happy to DIY in future, without waiting for hubby or calling someone else more handy! My favourite Ryobi ONE+ power tool is the cordless hedge trimmer because it was the one that had the biggest impact on our yard work and will continue to be a huge help in future too! However I also loved the idea of the battery operated mower because not only was it easy to use, but it was really effective in getting the job done too. Our spring yard maintenance project means our kids have a nicer space outside to play in, plus both the front and back yards look better, especially around those pesky garden beds that have been neglected for the better part of a decade. I am actually pretty excited about how we can make them even better going forward, now that we have the tools to assist us in the tougher jobs around the yard. And we will make sure not to leave it go so long in future either! 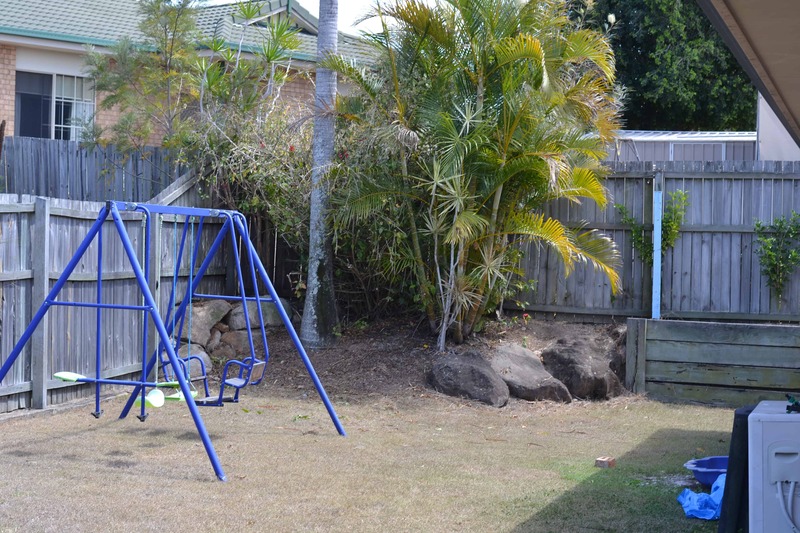 A much safer place for the kids to play without all the extra hiding places in the backyard, coming into the hotter weather. That back garden would have been a snake haven! Speak to your local Bunnings team about what tools you may need for your project. They are there to help! Keep on top of your maintenance – regular maintenance makes for a smaller job overall! 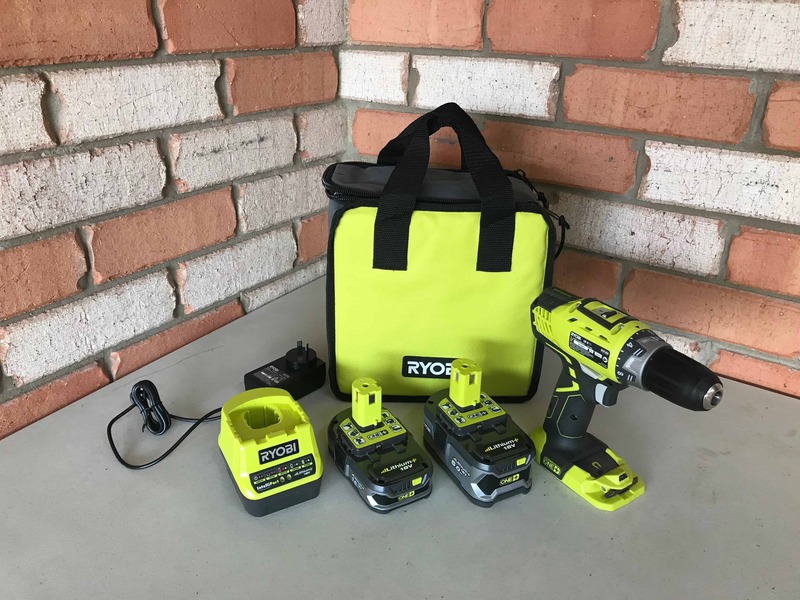 To learn more about the Ryobi One+ range and their other products, visit their website or your local Bunnings Hardware Store within Australia. All opinions, observations and comments in this article are my own. For further information, please refer to my disclosure policy. Is your yard in need of some spring cleaning and maintenance? Let us know the biggest project you have plans to tackle soon. Can I hire you to come over with all your awesome gear and do a spring clean in my yard?? We are not quite spring ready but definitely could use some of these tools. LOL I think one yard was enough! It definitely made the job easier with the right tools though. It sure is a big job keeping up with the yard work. I know that from experience when we owned our place. But right now we are renting a very new house with an equally new back and front yard. So all good. The tools and the flexibility offered look good. A brand new garden and yard is always nice and easy to maintain if you keep on top of it. It makes you remember how much easier the job would be when staying on top of it rather than letting it get out of control like ours did. Oops. that lawn mower sounds like exactly what we need, I can’t pull the cord hard enough any more with my weak shoulder! 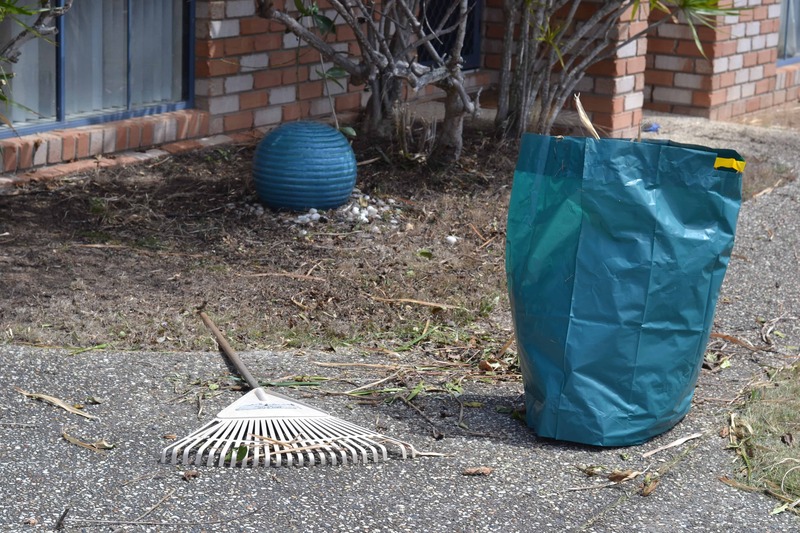 You’ve done a great job of tidying the yard, now it will be easier to maintain! Yes! It’s so easy with just a button and a handle you squeeze and away you go. I use all my mum’s garden tools when I come to the UK – it would be so much easier if they were cordless! What a great range! The battery definitely makes them a game changer. So much easier when you don’t need to be attached to the wall LOL I have a cordless vacuum too. great article – Ryobi is a very good entry level set of cordless tools! They were really easy to use, even for someone as clueless as I am with power tools! Nice article! And I love model Miss 3 🙂 I am also a Ryobi fan.